The Mobile Learning for Social Good Roundtable Although many non-profit and community organizations recognize the importance of having a strong mobile strategy, most organizations are not confident that their current strategy is adequate to enable them to thrive in a mobile-driven future. 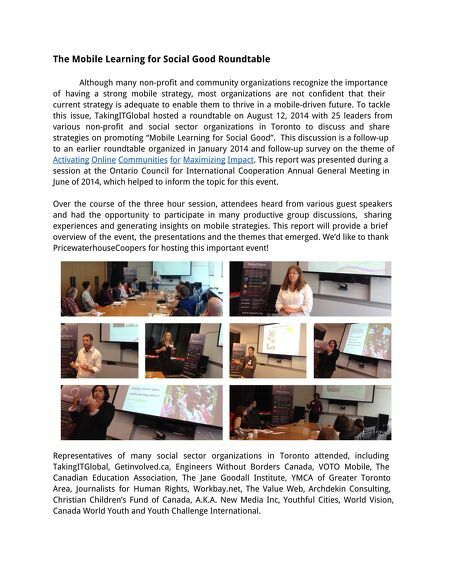 To tackle this issue, TakingITGlobal hosted a roundtable on August 12, 2014 with 25 leaders from various non-profit and social sector organizations in Toronto to discuss and share strategies on promoting "Mobile Learning for Social Good". This discussion is a follow-up to an earlier roundtable organized in January 2014 and follow-up survey on the theme of Activating Online Communities for Maximizing Impact. This report was presented during a session at the Ontario Council for International Cooperation Annual General Meeting in June of 2014, which helped to inform the topic for this event. 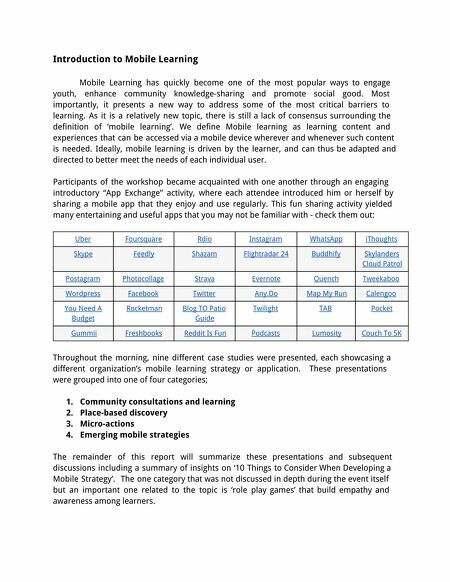 Over the course of the three hour session, attendees heard from various guest speakers and had the opportunity to participate in many productive group discussions, sharing experiences and generating insights on mobile strategies. This report will provide a brief overview of the event, the presentations and the themes that emerged. We'd like to thank PricewaterhouseCoopers for hosting this important event! Representatives of many social sector organizations in Toronto attended, including TakingITGlobal, Getinvolved.ca, Engineers Without Borders Canada, VOTO Mobile, The Canadian Education Association, The Jane Goodall Institute, YMCA of Greater Toronto Area, Journalists for Human Rights, Workbay.net, The Value Web, Archdekin Consulting, Christian Children's Fund of Canada, A.K.A. New Media Inc, Youthful Cities, World Vision, Canada World Youth and Youth Challenge International.